If you're utilizing Mimecast's services, you can whitelist KnowBe4 to allow our simulated phishing test emails and training notifications through to your end users. Below you'll find instructions for several different policies you'll need to implement in your Mimecast console in order to allow the use of KnowBe4's various services. If you run into issues whitelisting KnowBe4 in your Mimecast services, we recommend reaching out to Mimecast for specific instructions. You can also contact our Support team whenever you need assistance. The policies below are in a suggested order for the highest probability of success for your phishing security tests. 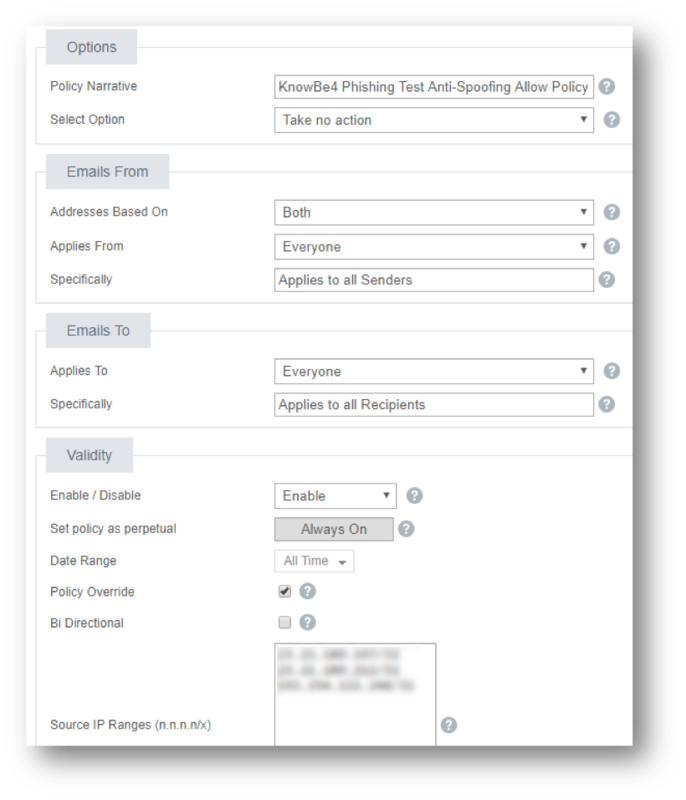 Below each Mimecast policy section, you'll find a description of the policy's purpose, regarding KnowBe4's phishing security test features. Create the appropriate policies in the order in which they're listed below. If you'd like to prevent Mimecast from re-writing the links in the Phishing tests you send, you can do so by adding KnowBe4's phish link domains as Permitted URLs in Mimecast. Our support team can provide a list of our phish link domains. Submit a support ticket to request this. Keep in mind, we don't recommend creating an exception for this unless you also have exceptions for other senders already in place. Otherwise, seeing anything other than a rewritten Mimecast URL will be a red flag for users and may skew your results. For more information on disabling link rewriting on permitted URLs, see Mimecast's Targeted Threat Protection: Managed URLs article (opens in a new window). 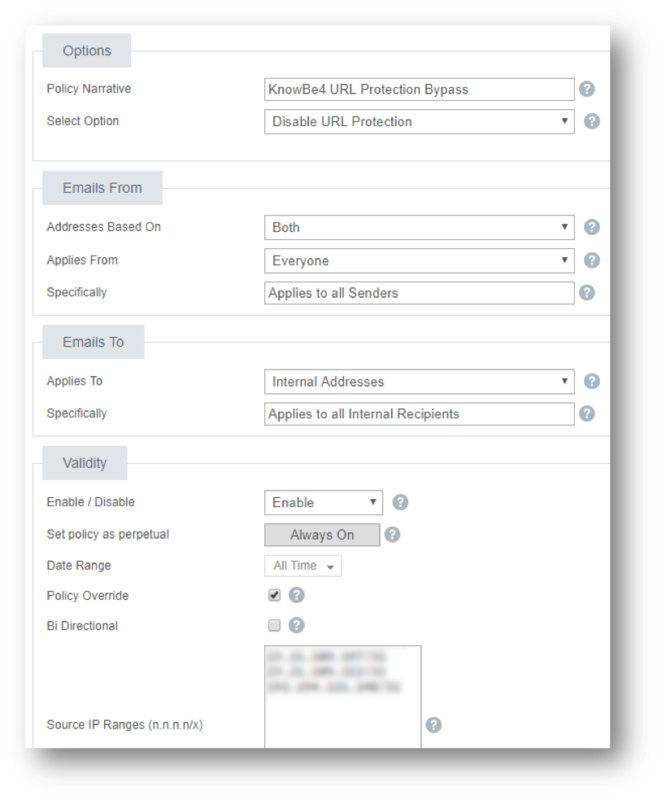 Follow the steps below to allow KnowBe4 to send emails appearing to come from an email address at your domain, on your behalf. Log on to your Mimecast Administration Console. Click the Administration toolbar button. Select Anti-Spoofing from the list of policies displayed. Select the New Policy button. Select the appropriate policy settings under the Options, Emails From, Emails To, and Validity sections. For more information on these settings, see Mimecast's Configuring an Anti-Spoofing Policy article (opens in a new window). Be sure to save the policy. This should allow the simulated phishing templates appearing to come from your organization's domain, to successfully reach your users' inboxes. We suggest setting up a test campaign to yourself or a small group of people to ensure the policy works as intended, before sending a campaign to all of your users. To successfully whitelist our phishing and training-related emails when using Mimecast, you should Create a new Permitted Sender policy to allow our phishing and training-related emails through to your users' inbox. Do not edit your default Permitted Sender policy. A new one must be created. Follow the steps below to allow KnowBe4 emails to arrive successfully in your users' inboxes. Select Permitted Senders from the list of policies displayed. Select the appropriate policy settings under the Options, Emails From, Emails To, and Validity sections. For more information on these settings see Mimecast's Configuring a Permitted Senders Policy article (opens in a new window). In the Source IP Ranges field (shown below), enter the appropriate IP ranges for your KnowBe4 account's location. See here for the IP ranges, listed above. Be sure to save the policy. We suggest setting up a test campaign to yourself or a small group of people to ensure the policy works as intended, before sending a campaign to all of your users. If you'd like to use attachments in your simulated phishing tests, follow the steps below to increase the likelihood that emails with attachments from KnowBe4 will successfully arrive in your users' inboxes. Mimecast may still prevent the delivery of attachments. Set up a test after creating this policy to ensure your desired attachment goes through. Select Attachment Protection Bypass from the list of policies displayed. 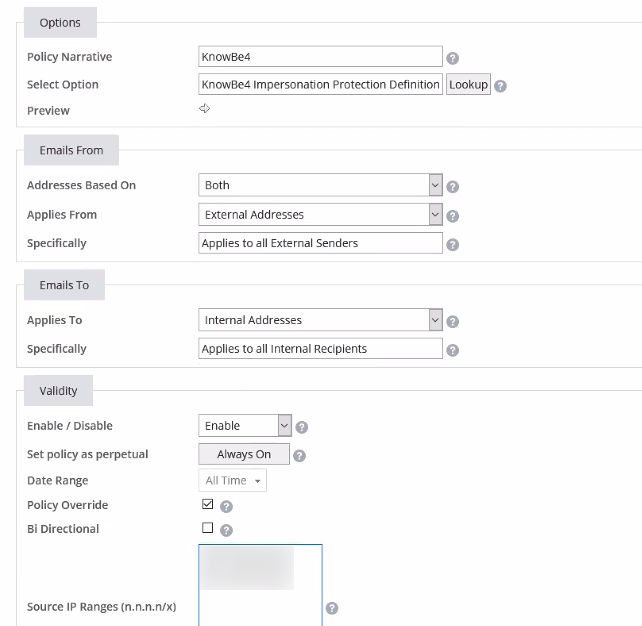 Select the appropriate policy settings under the Options, Emails From, Emails To, and Validity sections. For more information on these settings, see Mimecast's Configuring Attachment Protection Bypass Policies article (opens in a new window). Be sure to save this new policy. After allowing time for this new rule to propagate, we recommend setting up a phishing campaign to yourself, or a small group to test out the various attachment types. Mimecast's URL Protection service scans and checks links in emails upon delivery. This can sometimes result in false positives for your phishing security tests. Follow the steps below to create a URL Protection Bypass policy for accurate phishing security test results. Select URL Protection Bypass from the list of policies displayed. 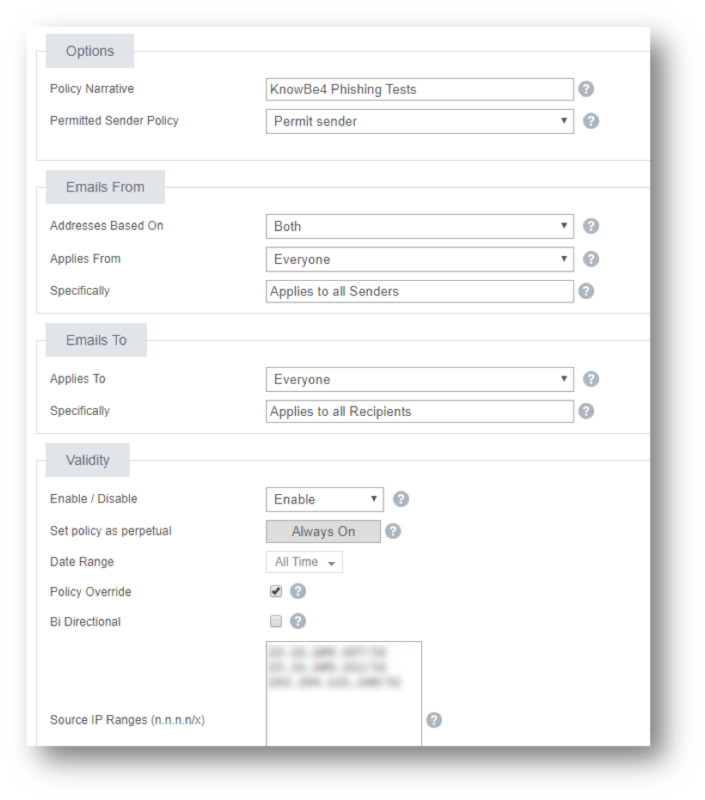 Select the appropriate policy settings under the Options, Emails From, Emails To, and Validity sections. For more information on these settings, see Mimecast's Configuring a URL Protection Bypass Policy article (opens in a new window). If you’re sending whaling/phishing emails purporting to come from users/domains that look like they are internal to your organization, you'll want to create an Impersonation Protection Policy in your Mimecast console. Follow the steps below to first create an Impersonation Protection Definition, then Impersonation Protection Bypass policy. Select the Impersonation Protection option from the list of definitions displayed. Select the New Definition button. Name your Definition something descriptive such as "KnowBe4 Impersonation Protection Bypass Definition." 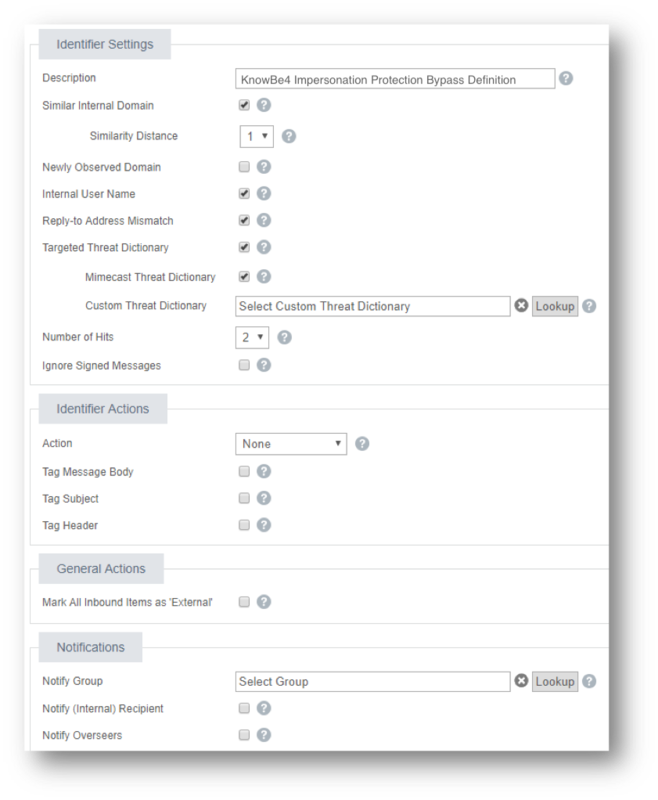 Select the appropriate definition settings under the Identifier Settings, Identifier Actions, General Actions, and Notifications sections, shown below. For more information on these settings, see Mimecast's Configuring an Impersonation Protection Definition article (opens in a new window). Be sure to save this definition before creating your Impersonation Protection Bypass Policy. Select Impersonation Protection Bypass from the list of policies displayed. Select the appropriate policy settings under the Options, Emails From, Emails To, and Validity sections. For more information on these settings, see Mimecast's Configuring an Impersonation Protection Bypass Policy article (opens in a new window). NOTE: In the Select Option field under Options, use the Impersonation Protection Definition you created (above). If you'd like to use attachments in your simulated phishing tests, follow the steps below to prevent attachments from being stripped from emails, potentially resulting in skewed test results. 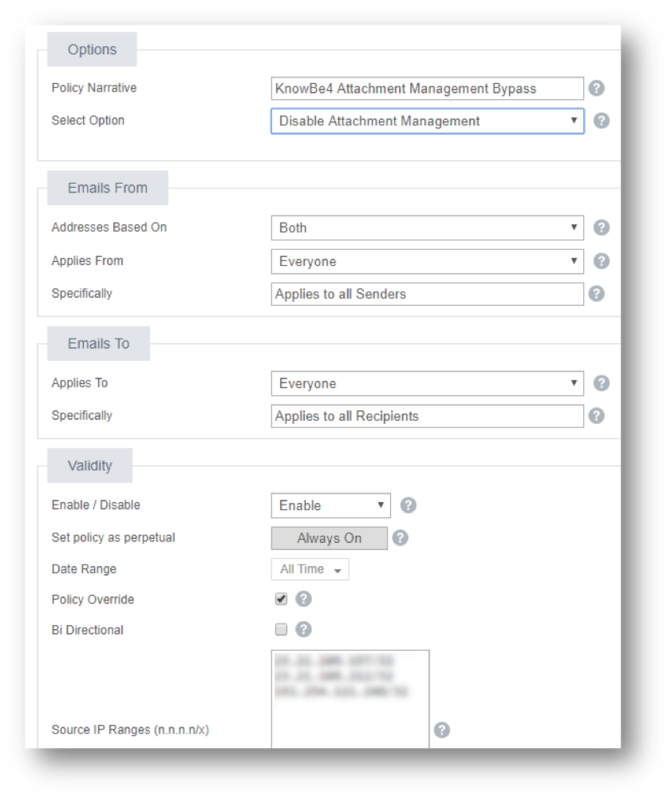 Select Attachment Management Bypass from the list of policies displayed. 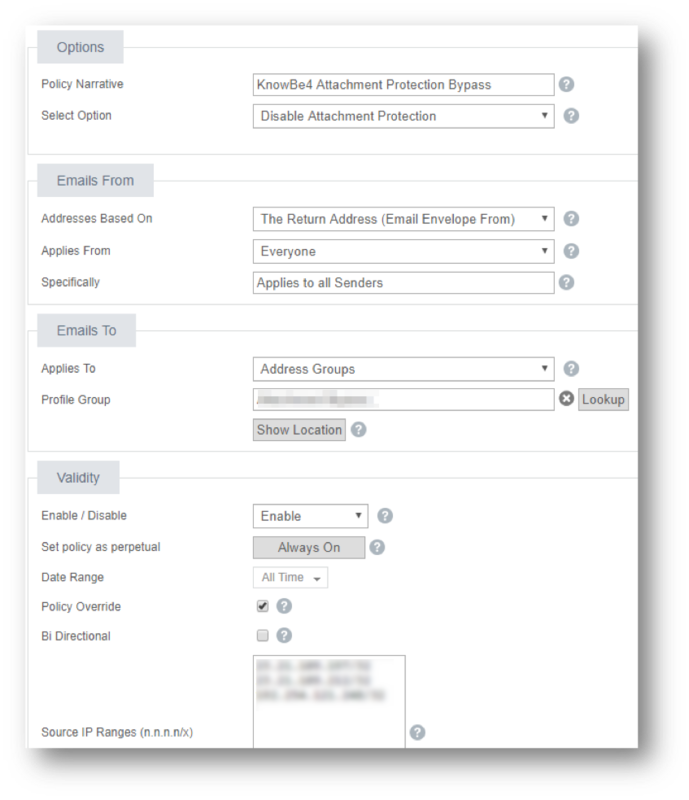 Select the appropriate policy settings under the Options, Emails From, Emails To, and Validity sections. For more information on these settings, see Mimecast's Configuring Attachment Management Bypass Policies article (opens in a new window).